What is it? It’s a replica of one of George Washington’s field cases, or canteens, and would have been a common object in the luggage of any 18th c. army officer. Field cases were used to carry the little niceties that an officer needed to supplement basic army rations, especially when entertaining as a gentleman should. This could include wine and other spirits, spices, a mustard pot, special sauces, a nutmeg grater, even silverware and serving pieces. This case is a recreation of one of a pair of cases once owned by George Washington while commander-in-chief of the Continental Army. It’s modeled closely on an original, now in the collection of the Mount Vernon Ladies' Association, Mount Vernon, and will eventually be on display at the Museum of the American Revolution, Philadelphia. The case will be part of the museum’s permanent exhibition of the First Oval Office, featuring a replica of General Washington’s field tent. 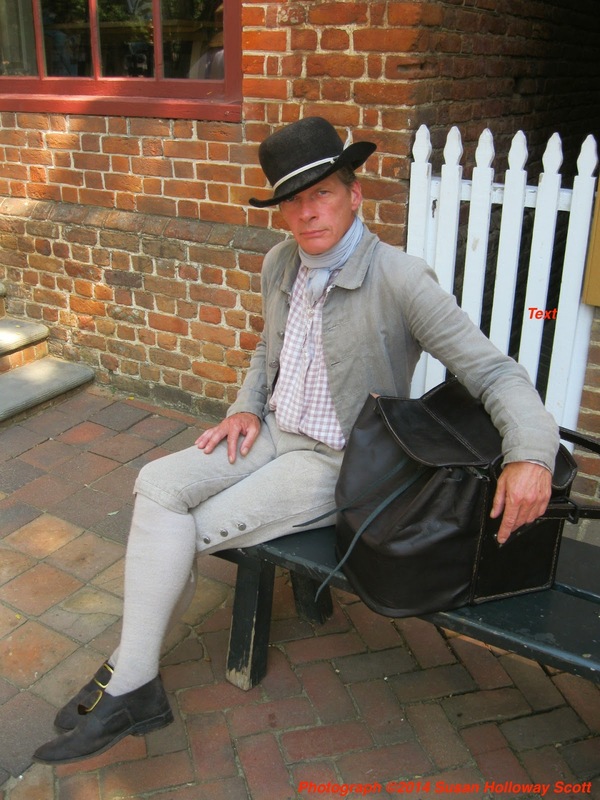 The reproduction is the collaborative work of several branches of Colonial Williamsburg’s historic trades program. Just as it would have been 250 years ago, the inside box frame was made of cypress wood by the joiners, the hardware was made by the blacksmiths, the interior tray made by the tinsmiths, and Jay cut and sewed the leather casing. The interior fabric was woven by hand by the Marshfield School of Weaving. Amanda Isaac, Assistant Curator, Mount Vernon's Ladies' Association, let the craftspeople study the original closely in order to make replica as exact as possible. The case has two separate compartments. The first, lined with green bay (a soft, woven, napped wool) and checked linen, would most likely have held a pair of square case bottles, separated by a divider (now lost.) The second compartment contains a fitted tin tray or pan whose use is something of mystery today. The compartments were closed with the flap that fits snugly over the top, and could be padlocked shut both to prevent rattling and breakage, and to discourage a sneaky thief. Empty, the case weighs about three pounds. Loaded, it could weigh as much as 25-30 lbs. The slanting handle was designed to be strapped onto pack-horse’s saddle. The original pair of cases would have been “mirrored” in design, to hang on either side of the horse’s back. Alternatively, the cases might have been stowed in the wagons carrying the general’s belongings. Considering his rank, Washington travelled very lightly, with only three wagons. In comparison, British generals could have as many as twelve wagons, filled with furniture, supplies, and cases like this one. Many thanks to Jay Howlett for his assistance with this post! All photographs ©2014 Susan Holloway Scott. My guess would be that the tin pan is a wash basin, to clean the silverware and serving pieces before packing them up again. My thought is the tin pan is for bags of coffee, tea or other dry goods. The tin keeps the bags dry from the ground and the loose top and tie strings allow for the bulkiness of the storage bags. The dry goods were more expensive and required an extra level of protection. This could have been a quick access bag, on horse instead of packed in a crate. I believe this type of kit would follow the officer in the field and be quick to set up and repack. I am curious what other think. Both good guesses. I'll ask around today and see if I can learn more of the possibilities. The trick is that there are so many "could have been", especially with resourceful men on a long campaign, but without historical documentation - a letter, a diary, a printed illustration - it's all speculation. Where do dukes come from?